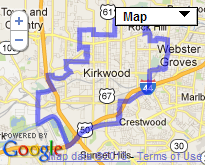 Deb is a health care professional and local businesswoman who is a part of the Kirkwood community. A longtime resident, Deb treasures the trees, the unique communities and the thriving businesses in the area. As a physical therapist and sole owner of an outpatient Physical Therapy outpatient clinic, Deb has built her professional reputation on results. She is recognized as a leader in her field and receives referrals from all around the region. Born and raised in New England, Deb left home to put herself through college at Marquette University in Milwaukee where she graduated with a Bachelor of Science in Physical Therapy. Soon after graduation, Deb moved to St. Louis and has resided here for over 30 years. Deb first sparked her interest in politics as a teenager when she participated in Girls State, a program sponsored by the American Legion Auxiliary. There she learned the importance and value of Democratic government. She put her enthusiasm to work in the following years by becoming involved in many local and state issues. Deb has worked the halls of the state capitol in Jefferson City to support issues important to her and the people in this district. In 2006, she worked for State Representative Barbara Fraser. Since 2003, Deb has had the great opportunity of being able to participate in raising her nephew Griffin. Deb is very proud of the young man he has become. He is currently enrolled at Meramec Community College. Deb is an active leader and enthusiastic volunteer in community service and community improvement endeavors. Deb’s been involved in the good works of Rotarians since 1985. •	Organizer, Meacham Park Community Garden. Building community around a garden!